I’ve loved all the excitement, but the stress has left me feeling pretty exhausted. And when I get exhausted, my old foes of anxiety and depression tend to come for a visit. I’m still working on finding a balance between filling my life with positive activities while also taking care of myself and not becoming overwhelmed. 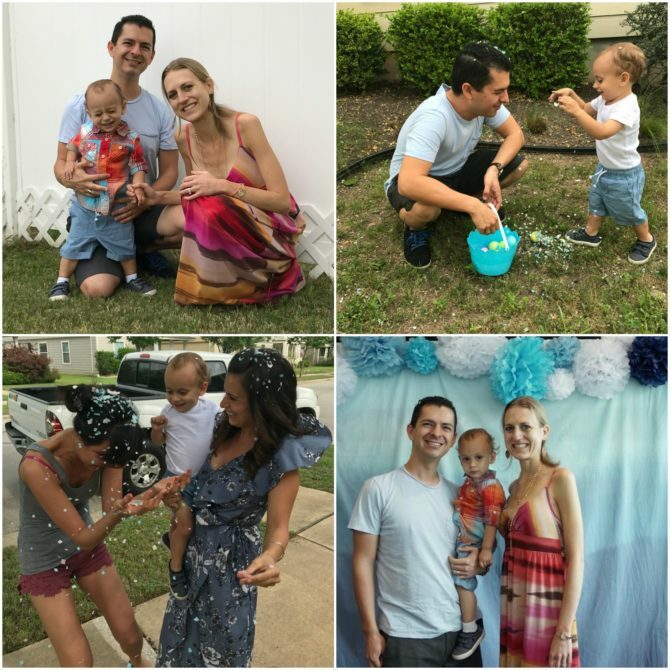 One perk to a busy month is that it provides lots of content for these monthly life recaps. Here’s a look at what I’ve been up to and into lately. 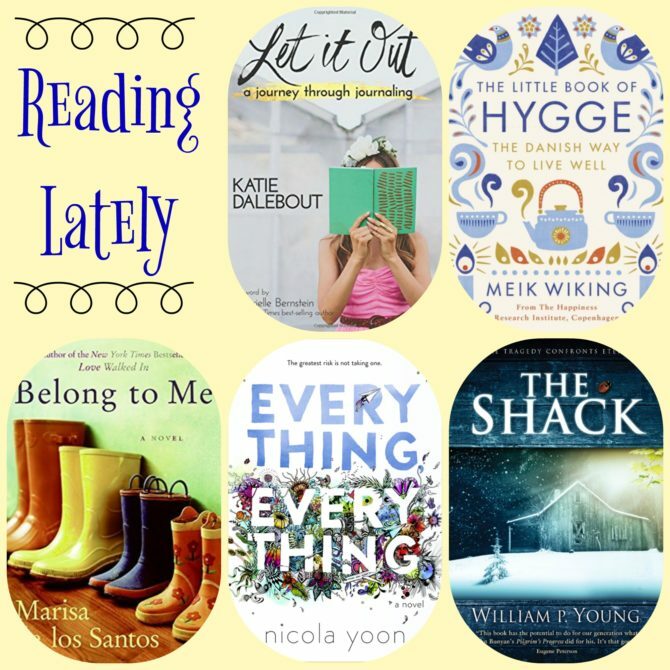 I like to try to spot trends in the books I’ve been reading, but this month’s books have really been all over the map. Inspired by my great experience with the movie, I returned to The Shack and loved it just as much the third time through. I also really enjoyed Belong to Me, which was much more engaging and of a higher caliber of writing than I’d expected. I did not feel the same way about Everything, Everything, which was a huge let down. As for nonfiction, I explored the (seemingly ubiquitous) subject of hygge with The Little Book of Hygge: The Danish Way to Live Well and now feel much better informed on this intriguing topic, and equipped to add some hygge into my own life. I’m currently working through a book about journaling from one of my favorite podcasters; it’s pretty out there (lots of spiritual stuff that’s not really in line with my personal beliefs) but I like the idea of incorporating some of Katie’s unique journal prompts into my already flourishing journal practice. 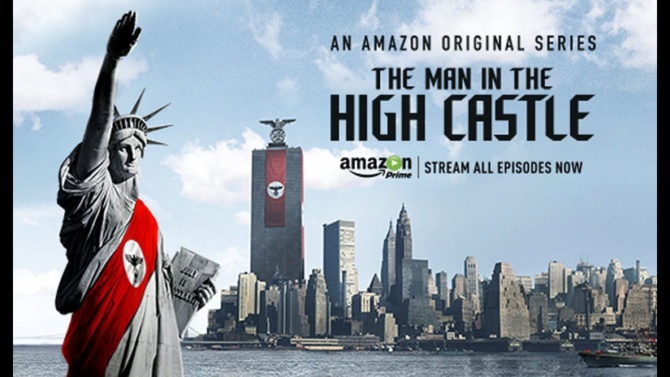 The Man in the High Castle: This Amazon show is built on the premise that the Axis powers won World War II, resulting in the division of the United States into two parts: the Greater Nazi Reich on the East coast and the Japanese Pacific States along the West, with a buffer zone down the middle. The series begins in 1962 and follows characters from all three sides (Japanese, German, and Resistance) as tensions mount in an alternate form of Cold War. As the show progresses, these characters’ stories become intertwined as they each come in contact with a series of mysterious films that show historical outcomes that are very different from the reality they know. This show is every bit as intense as its premise would suggest and though I generally steer clear of such heavy shows, this one grabbed my attention from the first episode and I couldn’t stop watching, even as I found myself holding my breath through many of the episodes. I was impressed with the production quality (amazing), the acting (incredible), and the gripping storylines. There is a lot going on, and I had trouble keeping up with the numerous plotlines, particularly once a sci-fi element was thrown in. Even after two seasons I’m still not entirely sure I know what is happening, but I’m eager to watch Season 3 to find out. The show’s biggest draw (for me) is the complex and highly nuanced characters. I had a hard time finding someone to root for, yet even the most deplorable characters (such as a vicious Nazi official) managed to gain my sympathy as they navigated universal human problems amidst highly surreal circumstances. Rarely have I seen a show that manages to capture humanity in such a unique and thought-provoking manner. Daddy’s Home: After the heaviness of The Man in the High Castle, we needed something funny to watch, and Luke picked this movie. I hadn’t even heard of it, but like Will Ferrell so I was game. In the movie Will Ferrell’s character, Brad, is a stepfather who wants to be the best possible dad to his wife Sara’s two kids. When Sara’s sweet-talking, free-spirited ex-husband, Dusty (played by Mark Wahlberg), comes back into town, the family dynamics are turned upside down as Brad struggles to keep up with Dusty’s “cool dad” persona. This is a cheesy and not-too-original film, but still funny and pretty sweet. Will Ferrell and Mark Wahlberg are, predictably, great together and definitely make the movie. I, along with everyone else who listens to podcasts (10 million downloads in the first week!) binged the S-Town podcast this month. Documentary-style podcasts aren’t usually my cup of tea, but I couldn’t resist the hype, and though I didn’t LOVE it like so many seemed to, I found it pretty compelling and thought it was amazingly well-produced. I also really liked that all the episodes were released at once, rather than one at a time, which added to the listening experience and also to the creative integrity of the show (whose course couldn’t be derailed by “new information” as happened with Serial and, more recently, Finding Richard Simmons). For those who might be unfamiliar with the premise, the show was marketed as an investigation of a suspected murder in a small Alabama town. By episode two, we learn that the show is not at all what we thought it was going to be about: a death does occur, and the remainder of the series explores the life of this highly unusual individual. I have SO many thoughts about this show. As a piece of artwork, it is truly remarkable, although I still don’t know how I feel about this sort of voyeuristic journalism being used for entertainment. And part of me is skeptical about the many coincidences that had to take place to make the show what it is; I don’t doubt that certain events did transpire, but editing can be a tricky thing, transforming fact into something that more closely resembles fiction. (I don’t want to give away any spoilers, but if you’ve listened, you can probably infer events that I’m referencing.) I didn’t care for the conclusion, which did not wrap things up very satisfyingly; I still have a lot of questions. If you are squeamish about foul language or disturbing content, this show isn’t for you, and in a big way I think it might have been too much for me to handle—days later, I’m still having disturbing S-Town dreams. But I don’t regret listening because it offered a fascinating look at humanity. 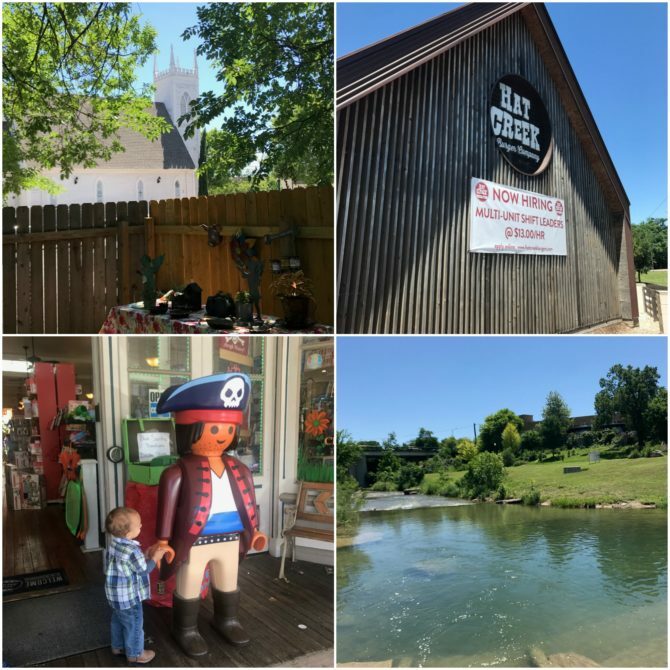 I was equal parts intrigued and revolted by the behavior and comments from many of the town members; their attitudes were very clearly in line with many stereotypes we have of the south, which I honestly did not believe still existed in America today. I hate that this is something I needed to be made aware of—it’s painful to dip my toes outside my own little bubble—but I also believe it’s important to learn about people whose lives and views are vastly different from my own. My biggest takeaway from the show was that people are complicated, our stories are all pretty messy, and even in art, answers aren’t always easy to come by. Side Note: If you’ve listened to S-Town and are looking for some more in-depth discussion of the show, check out this deep dive from the team at Sorta Awesome, as well as this Longform interview with the S-Town‘s host, Brian Reed. During the first few years of our marriage I discovered a love of baking, but I haven’t done much of it since becoming a mom. (Baking is messy, and I’ve had zero desire to add a messy kitchen to the host of messes that motherhood entails.) This month I decided to dust off my Kitchen Aid to make these banana muffins. They were such a hit that I’ve now made them three times! When you find a relatively healthy food that your picky toddler not only tolerates but actually requests, you’re happy to oblige! Since I avoid gluten, I can’t personally vouch for their taste, but they’ve gotten rave reviews from my many taste testers, and they’re certainly not difficult to make. 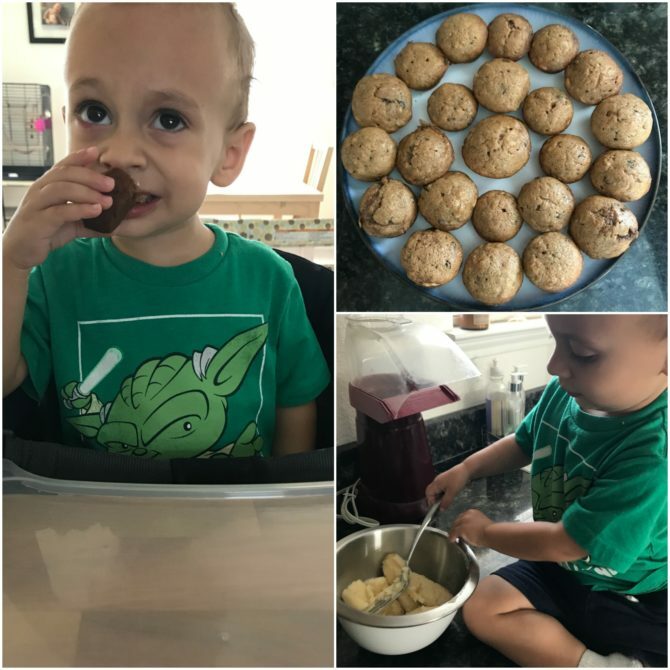 For my last batch, I followed the exact recipe but used a mini muffin tin and reduced the cooking time by a couple of minutes; they seemed to turn out fine, and Charlie preferred the smaller size, but Luke said the larger ones tasted better. 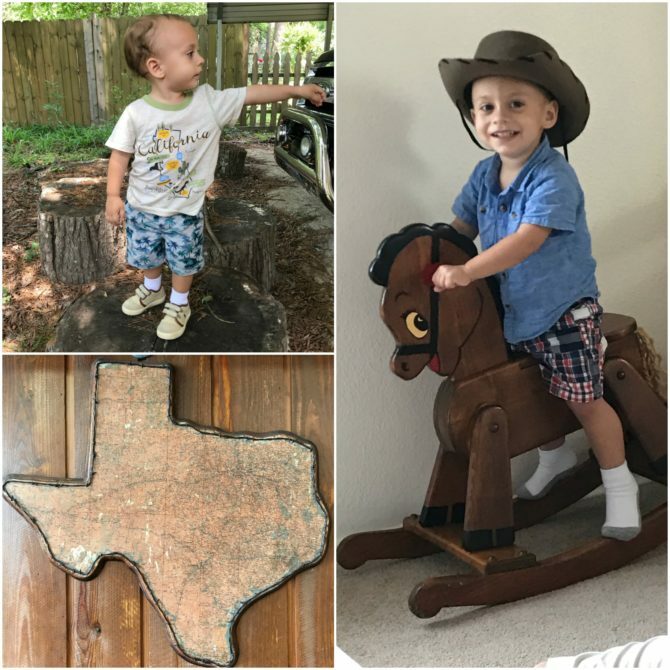 Charleston was 13.5 months when we moved to Texas, and he turned 27 months old on April 16—which means that he has now lived in Texas as long as he lived in California. It’s a silly milestone, but one that’s prompted quite a bit of reflection. Charlie seemed so old when we moved here, and it felt like he’d been with us forever; now he’s lived twice as long, and changed in more ways than I care to consider. These past 13+ months have simply flown by, even faster than the first year of his life, and that scares me because I feel as though I can hardly keep up and am somehow missing his childhood as it flashes before my eyes. The milestone also brings a touch of sadness as I think of how Charlie is not growing up in the place of his birth, a place that I myself called home for 32 years. I don’t have any regrets about moving to Texas, and I still don’t know if we’ll stay, but this month has me missing California in a new way as I think about what it would have been like for Charlie to have spent his second year of life there and how his present reality (OUR present reality) is so very different from what it might have been. I didn’t give myself a specific challenge this month. Instead, I’ve been trying to view every aspect of life through the lens of my word of the year, and I’ve been amazed at how transformational this mindset shift has been. I’ve become hyper-aware of ways I can love those around me, whether that’s a random act of kindness for a stranger or deliberate demonstration of service to a family member or friend. In doing this, I am finding myself falling in love with the people around me. I’m seeing the beauty within each individual I encounter and I want to do everything I can to help each person more fully become who God has made them to be. 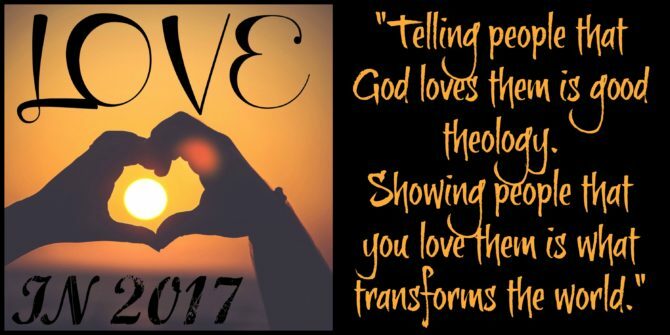 I set out this year to become more loving because I thought I should, but the more I love on others, the more I find myself wanting to do so. I had hoped to be a force for good in the world, but I am finding that the biggest and most positive changes are taking place in my own heart. Charleston and I joined our friends Salisa and Bennett for a day of berry picking at Sweet Berry Farm. The boys had fun picking berries for a while, but they spent most of their time admiring the goats and running through the fields while we mamas picked berries. I laughed at the thought that berry picking is generally considered a menial job, yet we actually paid to go and do it ourselves—but it was a lot of fun, and the berries were delicious! 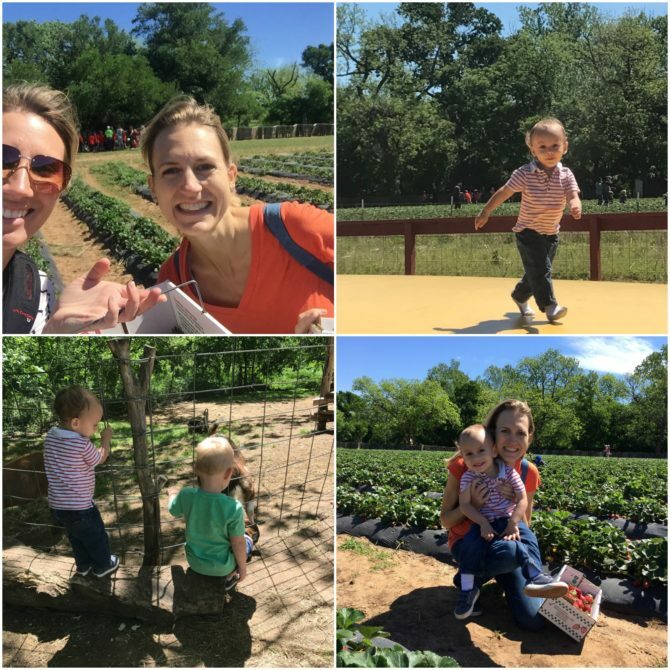 After filling up our baskets with berries, Charlie and I went for a ride on the farm’s little train, then the boys bounced on a bounce house and ate homemade strawberry ice cream. The day left them completely tuckered out, and Salisa and I got to indulge in some girl talk while they napped the whole drive home. Much of our month was dedicated to all things Easter! 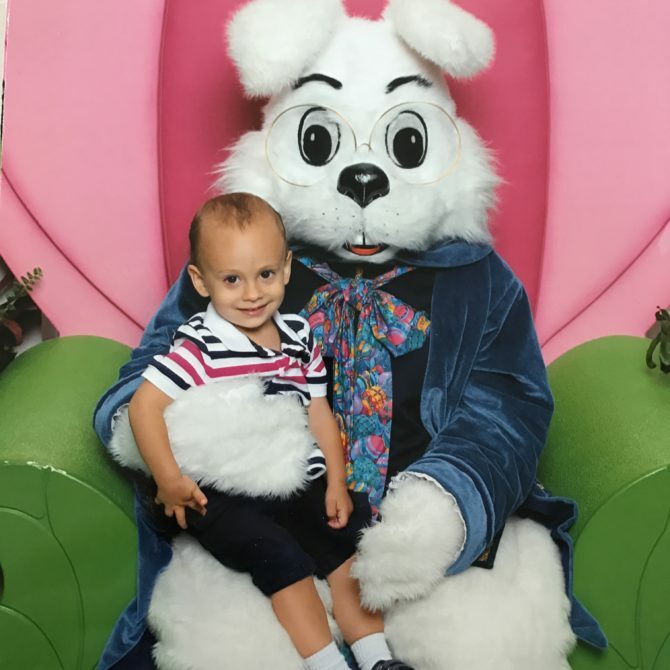 We took Charleston to see the Easter Bunny at the mall, and it was a very successful visit; lots of smiles and zero tears—a complete 180 from our visit to Santa last December. We prepared for Easter with some fun traditions at home, too. 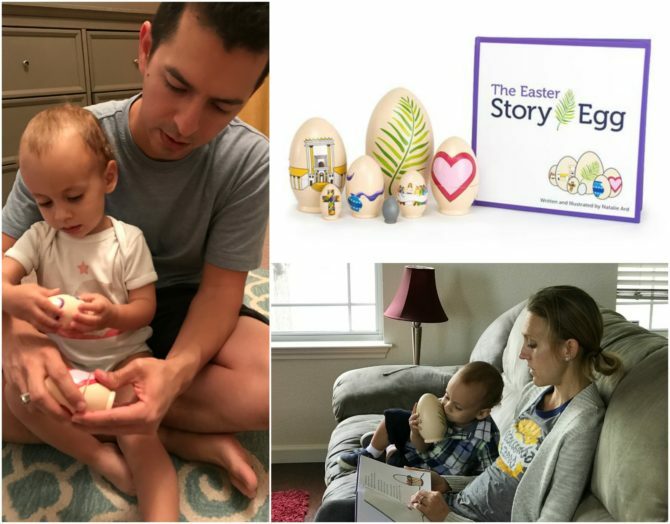 I shared in my Seasonal Seven post that I had bought the Easter Story Egg, an Advent-like tradition involving a wooden nesting set of eggs accompanied by a picture book that tells the Easter story. We all enjoyed taking part in this daily activity during the week leading up to Easter. 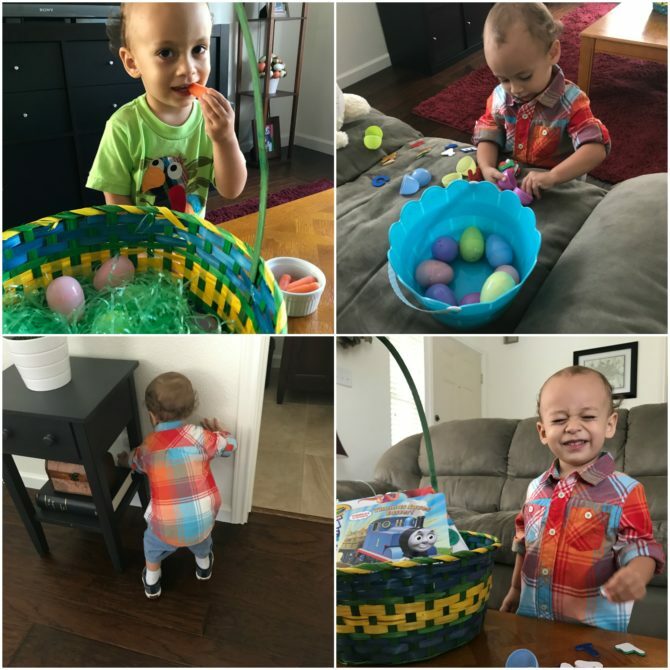 Charlie loved opening a new egg each day while I read the story, and it was a great way to prepare our hearts for Easter, beyond just bunnies and candy. Per our annual family tradition, we dyed eggs the Saturday before Easter. This was the first year Charlie could actually participate in the dying besides simply sitting and watching us. 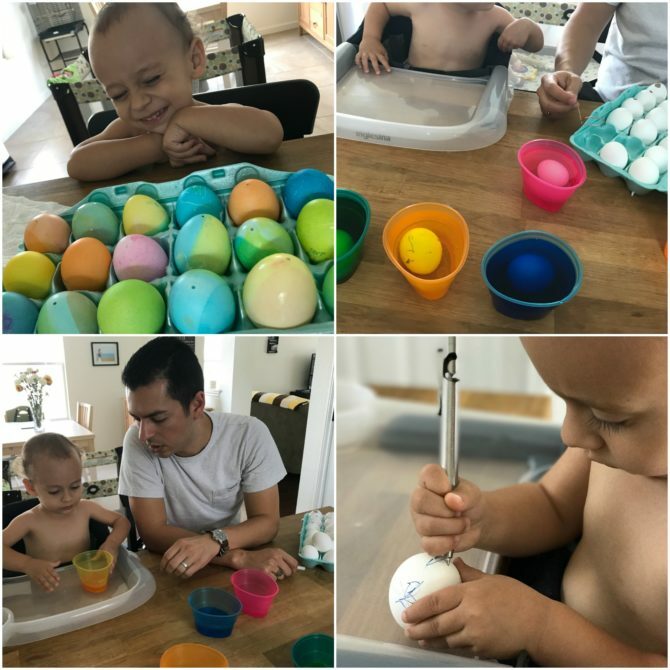 He wasn’t as into the dye part as I thought he would be, but enjoyed drawing on the eggs with a pen. This wasn’t our prettiest batch of Easter eggs, but thanks to our silly little toddler, it was probably the most fun we’ve had with the tradition! The night before Easter, we helped Charleston put out a dish of baby carrots for the Easter Bunny, along with a basket filled with plastic eggs for the Bunny to hide. The next morning he was thrilled to find the goodies the Easter Bunny had left him, and he had a blast searching for the plastic eggs. This was one of my favorite family traditions when I was a child, and it tickles me more than I can express to be doing it now with my son. On Easter morning we attended church. (I usually work in the nursery on Sundays, but had volunteered during the Saturday services so we could go to church as a family). Afterwards we had a relaxing afternoon with Amanda, Steven, and Amanda’s room mate Angel. We barbecued and then did a second egg hunt outside, complete with confetti eggs. These were a huge hit with Charlie and a tear-saving diversion after he accidentally stepped on (and squished) a hardboiled egg. 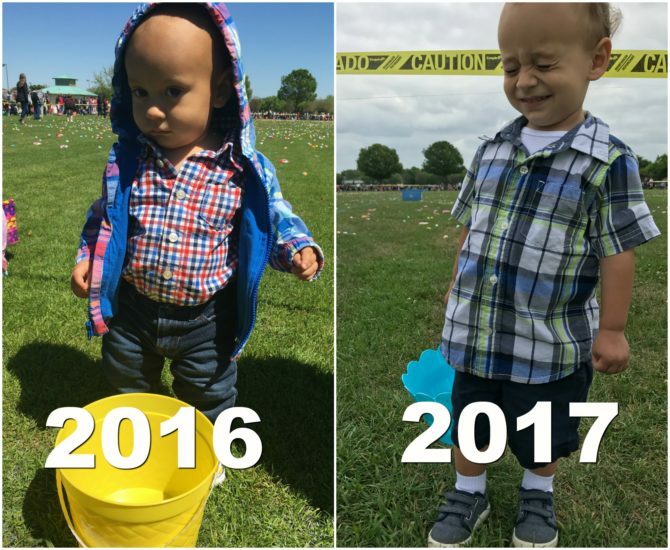 Next year we will go with all confetti eggs! Last weekend my parents came to town for their very first visit to Texas! I LOVED having them here and getting to show them around our new home state. 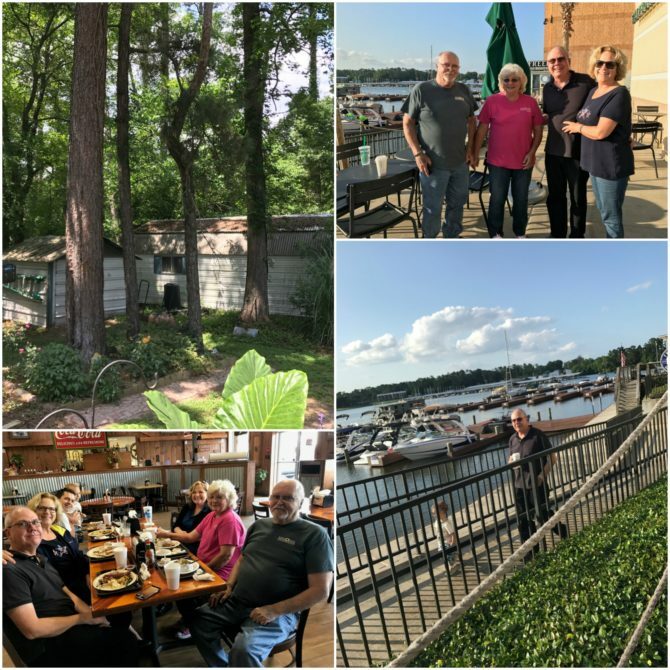 We spent the first day driving three hours out to Conroe (outside of Houston) to visit my dad’s cousin John, his wife Sandy, and their daughter Karri. We had barbeque at their favorite restaurant, followed by Starbucks overlooking a picture-perfect lake. It was a long day of driving, but Charlie was a stellar road-tripper and the long car ride gave us plenty of time to chat while being treated to views of the beautiful countryside outside the car windows. During their second day with us, we took my parents into downtown Austin. Luke’s brother Tommy was in town that day for work, so he joined us, as did Steven and Amanda. 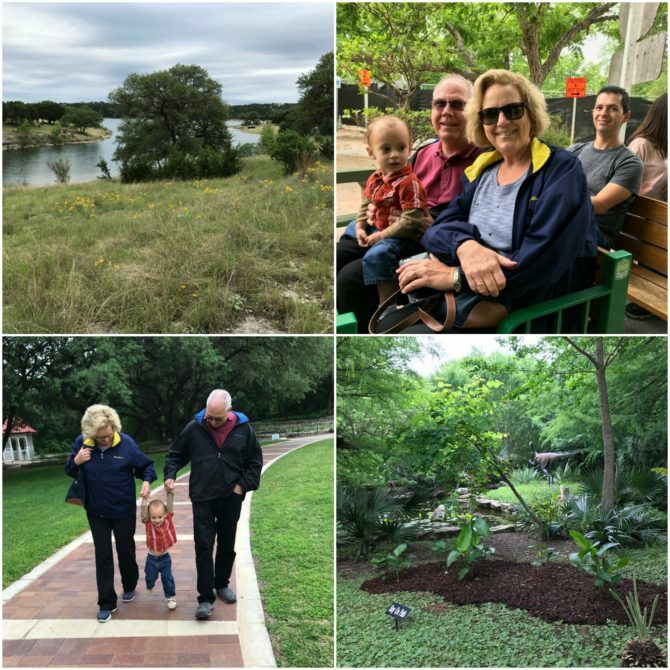 It was an unexpectedly chilly day, but we still enjoyed a lovely walk through the Botanical Gardens, followed by a ride on the train at Zilker park. Afterwards we had lunch at Gordough’s (my dad is a donut enthusiast, so this place was a hit) and spent some time driving through Hill Country and out to see Lake Travis. On our final day with my parents we got to bring them to our church, then had lunch at a cool restaurant in Georgetown. I’m kind of obsessed with this little town and was glad that my parents were charmed by it too. After walking around the square, Charlie was tired so we took advantage of a car-ride nap to drive out to Lake Buchanan. On Sunday evening we treated my parents to dinner from Vert’s; I couldn’t let them leave town without experiencing my very favorite restaurant! It was a quick trip for them, but we loved every minute of it. Charlie and I are already counting down the months until our next visit with Opa and Oma! Wow, what a lengthy post. If you’re still reading, Kudos to you for sticking through to the end! 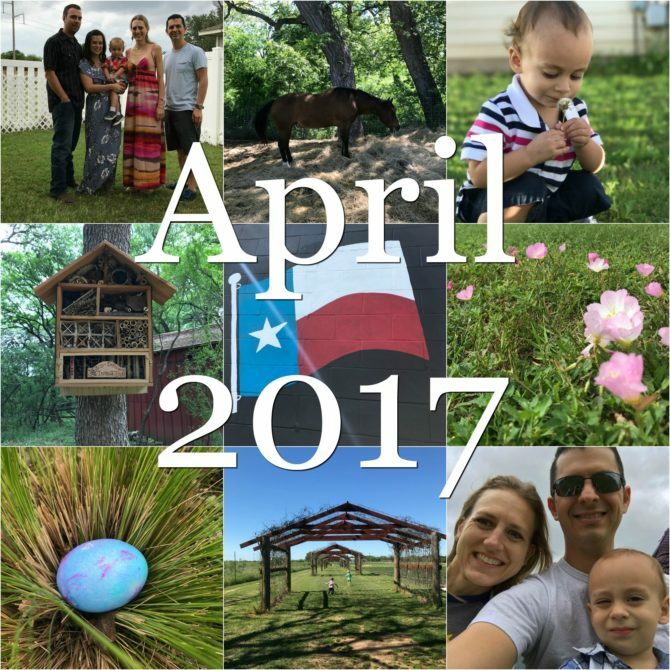 I’d love to hear about your April highlights! 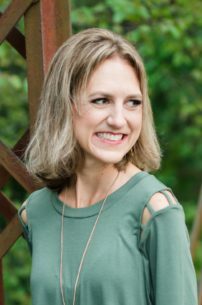 As always, I’m linking up with Leigh Kraemer to share what we’re into right now; head over there to read more recaps like this one from bloggers across the country!